In the wake of another mass shooting, this time at her own high school in Parkland, Florida, Emma Gonzalez stepped to a microphone and boldly called out the National Rifle Association and scores of politicians for their part in refusing stronger gun laws. The 18-year-old survivor's message – that the reasons for resisting heightened gun control are complete malarky – struck a chord throughout the country. But the words particularly resonated with one Montgomery County man, who was spurred into action. John Caruso, 66, of Collegeville, immediately knew it was time to turn in his guns. The U.S. Army veteran pulled out his three firearms and headed for the state police barracks in Schwenksville. He brought with him a Glock .45 caliber pistol, a Mossberg rifle and an AR-15 rifle – the same gun used in the Parkland massacre. Caruso handed them over, accepting no payment and requesting they be melted down, never to be used again. "It was my way of letting Emma know that there are people that understand that what is going on is wrong," Caruso said. "I am no longer going to support the NRA. There is just no way that I can say what they're doing is correct. On the contrary, they are just as bad as the people going in and doing the shooting." Caruso understands the horrors of falling under gunfire, having served in Korea's demilitarized zone in 1971. It's a hellacious experience that drove him to the bottle after he returned to civilian life. 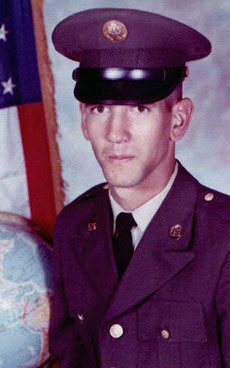 John Caruso, in his U.S. Army uniform in the early 1970s. The idea that an AR-15, a semi-automatic rifle, or any automatic firearms should be considered for recreational use is silly, Caruso said. The AR-15 first debuted as a fully-automatic rifle on the battlefields of Vietnam. "They were never meant for hunting," Caruso said. 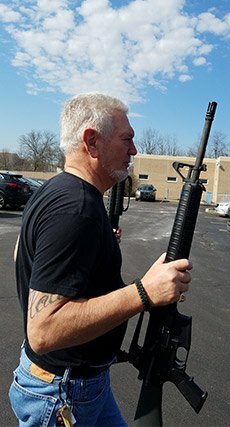 "They were made to be given to soldiers out in a place where you needed to fire as many rounds as you can to stop what's coming at you." Using an AR-15, Nikolas Cruz opened fire at Marjory Stoneman Douglas High School on Feb. 14, killing 17 people. The gun has been used in five of the six deadliest shootings in the last six years. Three days later, Gonzalez challenged the NRA, President Donald Trump and politicians who accept campaign contributions from the gun lobby as she spoke at a gun control rally in Fort Lauderdale. "They say tougher gun laws do not decrease violence. We call BS," Gonzalez said. "They say a good guy with a gun stops a bad guy with a gun. We call BS. They say guns are just tools like knives and are as dangerous as cars. We call BS. "They say no laws could have prevented the hundreds of senseless tragedies that have occurred. We call BS. That us kids don't know what we're talking about, that we're too young to understand how the government works. We call BS." Her emotional message struck Caruso, a married man with three children, including a 12-year-old daughter. "She's yelling at the people who have created this environment, where someone can come in and kill multiple people at a school where they have no way to defend themselves," Caruso said. "And you know what? She's on the mark." 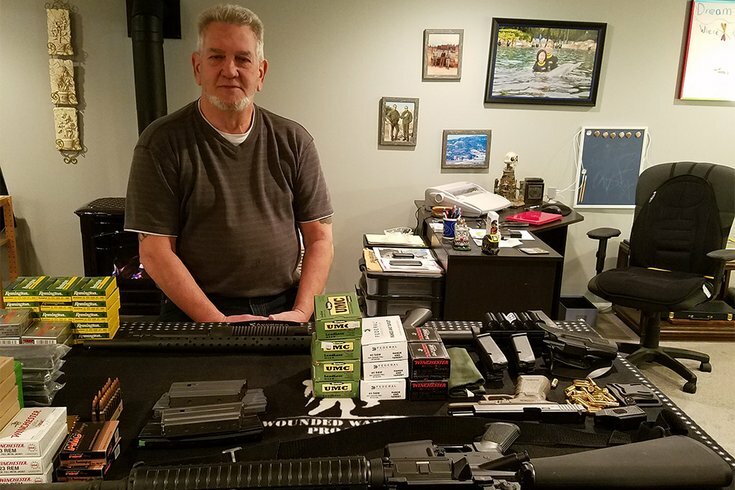 Caruso, a retiree who volunteers at Montgomery County's Veterans Treatment Court, had purchased his firearms after he returned to civilian life. He said he wanted to be ready in case he was ever needed to defend, or in the rare case of a societal breakdown. Trained as a sniper, he used them strictly for target practice. But in watching Gonzalez speak, Caruso realized he no longer needed his guns, nor did he have an urge to use them. So, he turned them over to police. "Those killings – it's a death. It's a child whose life ends immediately. How do you explain that as OK? There's no way that you can justify going into a school with a rapid-fire rifle and just shooting the school to hell. That's exactly what it is for those kids. It's hell." Caruso said he could have sold his weapons for significant amounts of money, given their pristine condition. But he feared they might ultimately end up in the hands of someone unfit to use them, so he handed them over to be melted down. "They asked me if I wanted money back," Caruso said. "I said, 'No, I want people's lives back. If you can't do that, then do what you can to stop this.' That's my stance and it's going to be my stance for the rest of my life." John Caruso carries an AR-15 rifle and a Mossberg rifle into the state police Skippack barracks in Schwenksville. John’s wife, Jane DeWitt, proudly shared the news on Facebook. “I’m sure some people are wondering if I convinced him to do this,” she wrote. “I can assure you I did not. I was just as astounded as anyone when John came up out of the Man Cave and told me what he had decided to do. We never discussed his guns, except when I’d ask him if they were locked up before friends came over. He never leaves them out, I never see them. We never talked about them. Caruso said he respects hunters and gun collectors who keep their firearms stored safely in vaults where others cannot access them. But he said the United States must find ways to ensure that people who are not fit to own guns cannot access them – especially the most deadly weapons. "I don't know how I would handle it," Caruso said. "But I certainly know I would take the guns that are meant to shoot many, many rounds and kill as many people as possible – they should not be recreational. Those guns are not toys. "I had them strictly for what I thought was a good reason. And then a kid, Miss Gonzalez, changed my mind on that. I realized I have no need for those guns. I don't have any urge to use them, so why do I have them?" Now, he no longer does.